Niq van der Aa, known online as Detailed-Illusion, is a cosplayer and aspiring costume designer from Ottawa, Ontario. 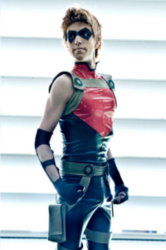 He has been cosplaying since he was 14 years old and went to his first con when he was 13. Niq is an avid gamer and a frequent reader of both American comics and Japanese manga. In high school, he studied theatre where he ended up focusing on backstage work as a set and costume designer. After high school, he toured with a theatre show to the Edinburgh Fringe Festival in Scotland, for which he was both a costume and set designer, as well as a performer. Between dabbling in Fashion Design school, working as a costume designer, and of course continuing to go to as many cons a year as he can afford, Niq has created plenty of new costumes for each one! He has worked his way up the ranks, entering masquerades in America and Canada, and is now a master level cosplayer. He considers his specialty is pattern drafting, detailed sewing, and accessory work. As part of team "Detailed Mess" he has won the first World Cosplay Summit Canadian preliminaries and will represent Canada along with Miss Messy Mia in WCS 2015 in Japan. His most notable awards in the Masters category were for Best Reinterpretation for his Genderbent Elsa (Costume-Con 32, 2014) and Best in Show for his Thranduil (Pop Expo 2013).